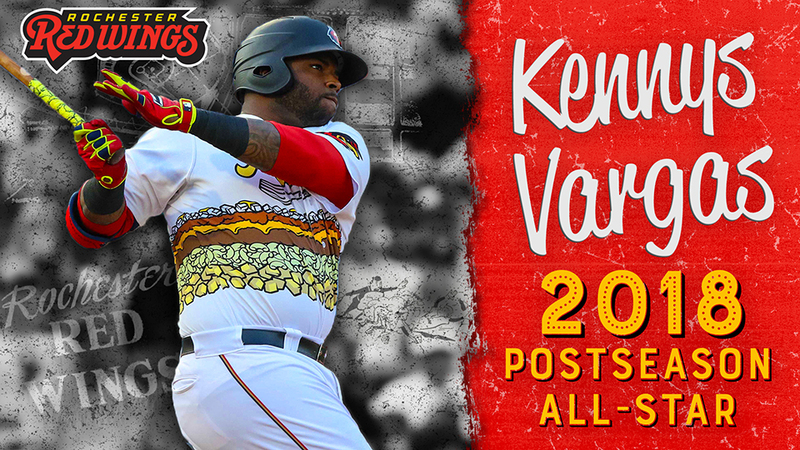 Rochester Red Wings first baseman Kennys Vargas has been named the designated hitter on the International League Postseason All-Star Team, the league office announced today. Vargas is batting .234/.322/.415 with 19 doubles, 20 home runs, 67 RBI, 38 runs scored, 55 walks and 127 strikeouts in 122 games with Rochester this season. He ranks third in the league in home runs and his 50 career homers as a Red Wing are second during the Twins era behind only Garrett Jones (81). Vargas is the team leader in hits, doubles, homers, RBI, runs and walks. He has 26 multi-hit games, one multi-homer game and 17 multi-RBI games, including a two homer, six RBI game in game one on May 25 vs. Buffalo. Vargas has been on a roll lately, batting .396 (19-for-48) with five doubles, five homers, 16 RBI and seven runs scored in his last 13 games since August 14. Over that period, he leads the IL in RBI, slugging (.813) and OPS (1.285) while tying for the lead in home runs. He is the first Red Wing to be named the DH on the Postseason All-Star Team since Willis Otanez in 1998 and fourth since the current ballot format began in 1978. This marks Vargas' third end-of-season All-Star selection, joining 2013 with Single-A Ft. Myers (Florida State League) and 2010 with the GCL Twins (Gulf Coast League).